Tablet PCs 'mysterious' from Toshiba first appeared in the event the Consumer Electronic Show. At that time the 10.1-inch tablet is apparently still running Android v2.2 aka Froyo. Do not stop there, this tablet also enliven the event Mobile World Congress. 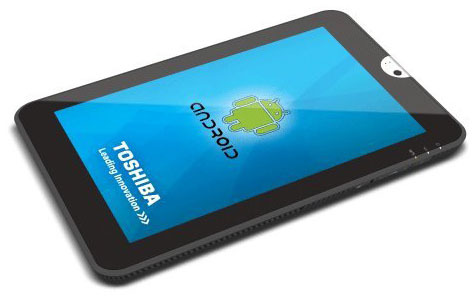 Even when the creation Toshiba tablet is ready to run the Android platform Honeycomb. And finally, the mystery associated tablet made by Toshiba are now beginning to unfold named Toshiba ANT. The tablet is in addition to the Android platform comes with Honeycomb is also equipped with trim specifications, such as dual-core processor Tegra 2 with 1 GHz clockspeed made by NVIDIA, 10.1-inch screen with a depth of 1280 x 800 pixels, plus a 6 cell battery that is ready mendayai devices up to 7 hours. Not only that, Toshiba ANT treat comes with the main camera with a resolution of 5 MP camera with autofocus and a secondary camera on the front of the class 2MP which can be used for 'video conferencing'. As a complement to this tablet presents some interesting features such as stereo speakers, HDMI port, full-size USB connector, a mini-USB port, and SD card slot. Unfortunately, did not say when the tablet PC of this Android made its debut on the market. Even so, as quoted PULSAonline via phandroid, ANT was originally rumored that Toshiba will come with three variants, namely Toshiba ANT-100 (8GB), Toshiba ANT-102 (16GB), and Toshiba ANT-104 (32GB). With the price in a row starting at $450, $500, and $580.